I feel as if you need to be a certain type of person to really like Survive and somehow, I just didn’t fit into that role. Not only have I never been depressed, known anyone who has committed suicide, or known anyone who has died from cancer, I’ve also read more than my fair share of survival stories. 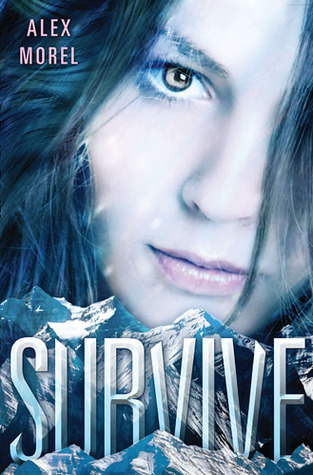 For me, Survive was one of those novels where the author threw you head-first into the conflicted emotions of a character and almost expected you to understand them opposed to making you understand them, and that is where the majority of my problems lie with this story. While it has a fascinating premises, Survive simply does not work to create a rich and compelling novel about suicide and familial issues while simultaneously throwing in a plot of survival, which made my experience with this story far from exhilarating. I think the plotline of Survive is quite standard and predictable if you’ve read a decent amount of survival novels and YA Romance stories. Jane, our protagonist, is flying home to visit her mother after spending some time in a facility where she has been fooling her doctors into thinking she is no longer suicidal. Just when Jane is about to kill herself on the plane though, the airplane crashes, leaving her stranded on a mountain during a blizzard with only one other passenger – her flight-mate, Paul. As Paul and Jane struggle to survive, Jane also slowly begins to realize the beauty and gift that living truly is, but just as she is beginning to want to live, the question of her survival in the wilderness hangs over her head like a plague. I really enjoyed the premises of Survive, but I found the novel to be extremely hard to get into. In fact, the plane doesn’t even crash until nearly a third of the story is over and all we’ve actually learned in that time is that the only reason Jane feels compelled to commit suicide is because her father and grandmother and other members of her family have killed themselves too. Call me heartless, but I didn’t think that was enough of a reason to really want to kill yourself. I mean, generations of my family have had diabetes, but that doesn’t mean I’m stuffing myself with unhealthy food so I can get diabetes too! I just couldn’t connect with Jane on any level and found her narration to be difficult to read as well since my attention kept wandering. Furthermore, I couldn’t comprehend how Jane’s desire to kill herself evaporated once she realized that she and Paul were the lone survivors of their plane crash. While I do agree that life-threatening situations can really change a person’s outlook on the world, I felt as if her change of heart was too drastic to really be moving or realistic in the least. Jane aside, I thought the romance in this story was quite unnecessary. I’ll admit that I liked Paul and enjoyed many of his conversations with Jane, but I wasn’t invested in this whirlwind love story at all. Plus, I found the ending of this story to be too predictable, not to mention the actual survival feats to be lame and disappointing. I’ve read much better survival stories than this one and really can’t recommend this to anyone, unless you haven’t read any survival stories in the past. If you’re looking for a survival story, look elsewhere. If you’re looking for a deep and provocative read, also look elsewhere. I just don’t feel like this is a book I’d want anyone else to read – it was disappointing on way too many levels. No problem, Rachel! I'm glad you found it to be helpful! :) I was very much disappointed by this one, so I'd definitely recommend skipping it. Shame to hear this book was a disappointment to you. I was actually looking forward to this one, though I must admit survival books in YA haven't been the best lately . . . Anyway nice and honest review! Thanks Erin! (: I haven't read any other survival stories in YA, but they definitely can't beat some of the classics for sure!